The hike this Sunday was great. 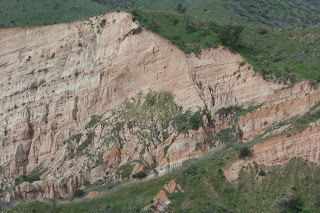 We hiked 8 miles in Limestone Canyon and along Loma Ridge. The day was overcast so it was cool out. 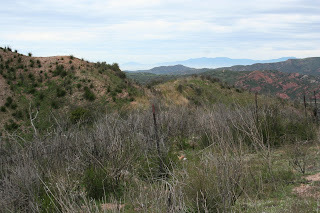 We began by hiking up to the ridge then walked along it until we dropped down into Limestone canyon which we followed until we returned to the parking lot. 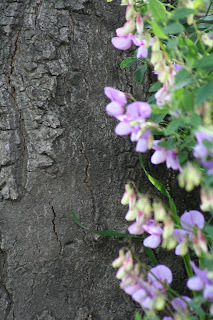 We saw popcorn flower, Johnny jump-ups, California poppies, fiddle-neck, possibly chapparal pea, and some unidentified but beautiful and fragrant pale purple flowers. We saw non-natives like filigree (also called storksbill). The birds of the day included turkey vultures overhead, a red-tail coming remarkably close on the ridgeline, bushtits, northern flickers, Nuttall's woodpeckers, and oak titmice. I also heard orange-crowned warblers, yellow-rumped warblers, and house finches calling. I was concerned it would rain, but the entire hike was cool, cloudy, and dry, nice hiking weather. 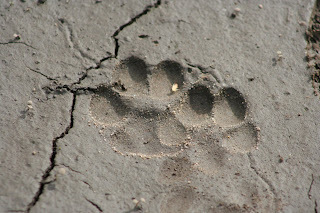 We walked comfortably, and a small group broke off to check out the Sinks, which I had seen the previous day. It was a great hike, and I truly recommend it, I know if it's offered again, I'll be signed up! 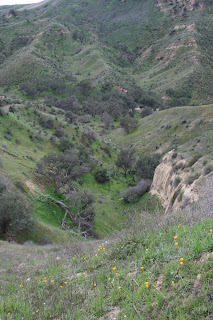 Yesterday I went on a hike to the Sinks in Limestone Canyon. 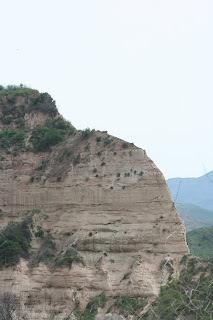 The sinks are a geologic feature where the land has dropped down creating sheer cliff faces. The hike lasted 5 miles and 4 hours and included birds - cactus wrens, olive-sided flycatchers, lesser goldfinches, red-tailed hawks, ect. Included insects like - cabbage whites, ladies, Sara orange-tips, and ladybird beetles. Included flowers and plants like - miniature lupins, fiddle-necks, California poppies, chaparral pea, whorehound, wild cucumber, and gooseberry. 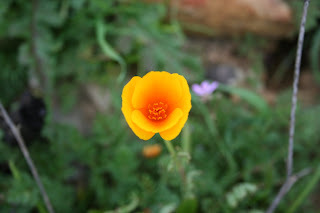 Often called the "Grand Canyon of Orange County"
When I own my own home, I will have a lovely native plant garden. Well this weekend *fingers crossed* may actually give us a break from this rainy weather! Not that I'm not happy that CA is getting some much needed precipitation, but it'd be great to get outdoors. My cabin fever has been slightly mitigated by the fact that my cousin is teaching me to quilt, however, sometimes you just need to get outside! 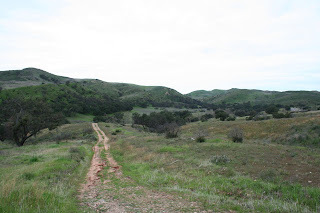 I'm signed up for two very exciting sounding hikes this weekend on Irvine Ranch Wildland's property. 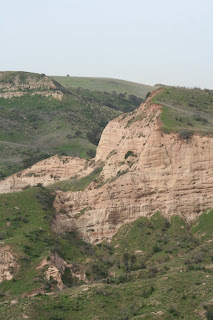 Saturday will be a geology hike to the sinks in Limestone Canyon. I'm very excited about this since I've heard so many good things about Limestone but I've never had the pleasure of hiking there. The description reads: "Take a moderately strenuous hike to the spectacular cliffs called the Sinks. 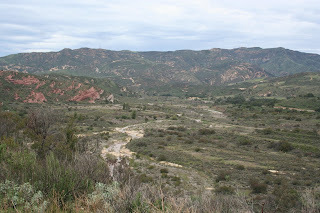 Learn about the geology of Orange County, the Irvine Ranch, and how this unusual formation originated." Sounds great to me, I love geology, and it's something I haven't studied much beyond my one college introductory geology course sophomore year. 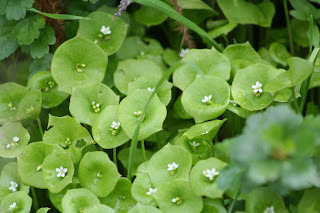 Sunday I'll be attending a wildflower hike on Lomas Ridge. 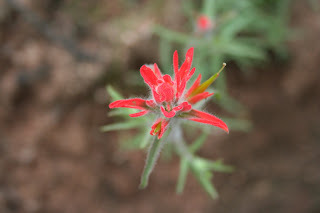 That program's description reads: "Last year the wildflowers along Lomas Ridge trail were spectacular. Depending on rain fall, we hope to have another showy year. We will be traveling up Hick’s Haul Rd. and then climbing to Lomas Ridge. 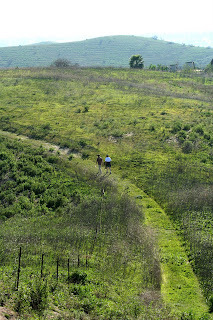 Lomas Ridge has several ups and downs. 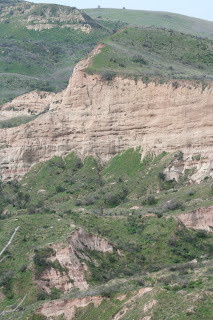 This is an out and back hike if Limestone Canyon is closed. If the wildflower do not cooperate this year, at least the views from Lomas Ridge are incredible. Although the pace is slow, the distance is approximately 8 – 10 miles depending on the route and the elevation gain 800 – 1000’. Please wear appropriate clothing, carry snacks, and bring enough water for a 4 hour hike. Don’t forget to bring your camera!" Hopefully I'll have photos and stories to report come Sunday evening, I look forward to sharing with you all. Sunday I went on a hike in Hick's Canyon. This trail is not open to the general public, but is open for certain programs with the Irvine Ranch Conservancy. The hike I attended is no longer going to be offered because a newer, better trail is being opened down the road, and that particular hike will henceforth be held there. I began my walk a little after 2:45pm, and immediately the trail heads steeply uphill. In the scrubby trees around me, Cassin's kingbirds were calling and chasing each other about. Song sparrows and house finches added their calls to the general hubbub. At the crest of the first hill is a tiny reservoir filled with water and a few reeds. In this little pond I found a common yellowthroat, and my best bird of the day - a ring-necked duck. These ducks are simple, but deceptively pretty, with subtle facial markings. Moving on along the trail, lesser goldfinches were piping their plaintive calls, and flying around in large flocks. Ravens overhead croaked as they flew back and forth across the canyon. In the distance a red-tailed hawk circled on the afternoon thermals. The hills continued, despite the trail being less than 1 3/4 miles, it's a decent workout when you factor in the 4 steep hills you climb to get out, and then back across them on the return trip, phew! In terms of non-bird life, there were American ladies fluttering across the trails, causing me to look quite ridiculous as I chased after them in hopes of a good shot. Cabbage whites also graced the path, but were far less numerous than the ladies. 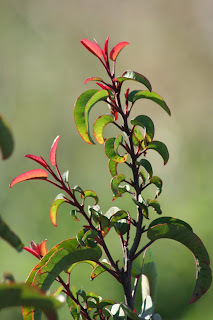 Laurel Sumac - a frost indicator plant. Wildflowers growing along the trail were blue dicks, a simple purplish-blue flower, as well as non-native invasive mustard plants. There was also scrub oak, a single elderberry bush, plenty of lemonade berry looking decidedly burned, as well as another non-native invasive species - artichoke thistle. Yuck. I spent some time photographing laurel sumac with sunlight filtering through it in the most attractive way, and then headed home along the trail.